Fethiye is like a mirror-reflection of this heaven, as it presents you a combination of staggeringly turquoise water, long, white-sanded shoreline and emerald-green forests. Fethiye Paragliding is a very famous activity as it offers the chance of watching this miraculous city and nature above, like a bird in the amorphous sky. 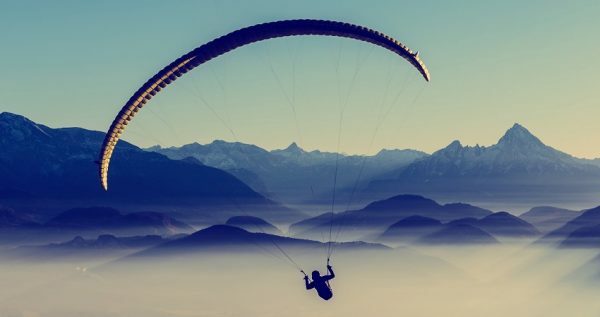 Paragliding is a both recreational and competitive airsport. To do it, you need a paraglider, a free-flying, foot-launched aircraft. You will also be assisted by a skilled and experienced professional pilot on the air. He sits in a harness, suspended below a fabric wing behind you. 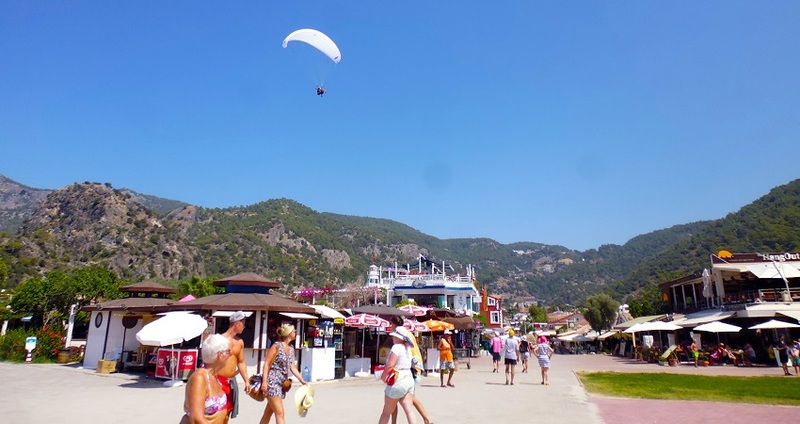 Fethiye is a convenient place for people seeking adventures during their holidays, as it is a very popular location for paragliding in Turkey. A lot of tourists coming from various cities and countries to live through a world-class experience. 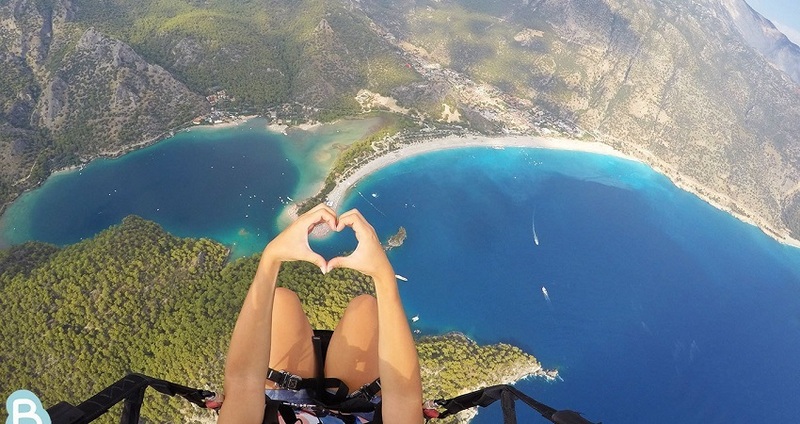 After leaving Fethiye, we are sure that you will be leaving with happily crossing one item on your bucket list. When you join our Fethiye paragliding excursion, we will take you to best spot to paraglide, which is Oludeniz in Fethiye. You will see how amazing the pearl-colored rock shoreline joins with topaz blue sea while flying with the other paragliders above the sea. We will offer you this excursion through professional schools that concentrates only on paragliding. 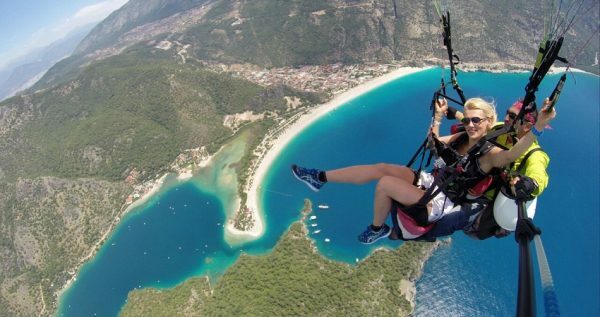 You will experience this splendid opportunity off of Babadag Mountain located in Oludeniz, Fethiye. It is about 1960 meters high from the sea-level. 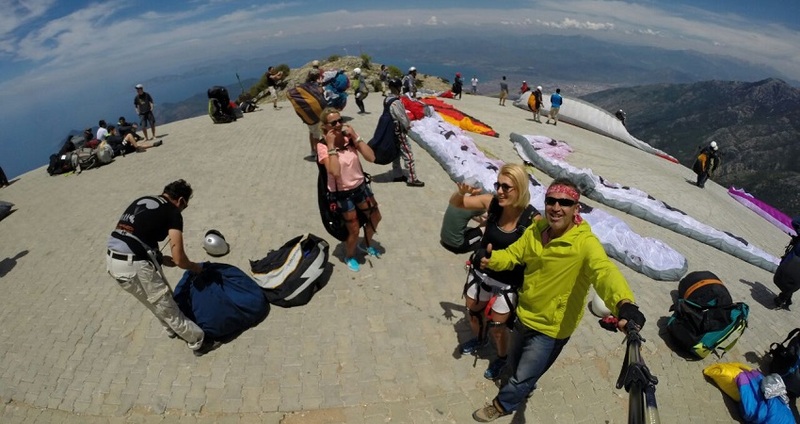 On this tremendous mountain, you will be presented with three different paragliding departure runways. You will have no troubles with the assistance of our experienced trainers. After taking off, the only thing you have to do is to enjoy the spectacular view of Oludeniz, Belcekiz, Kayakoy, and Fethiye itself. 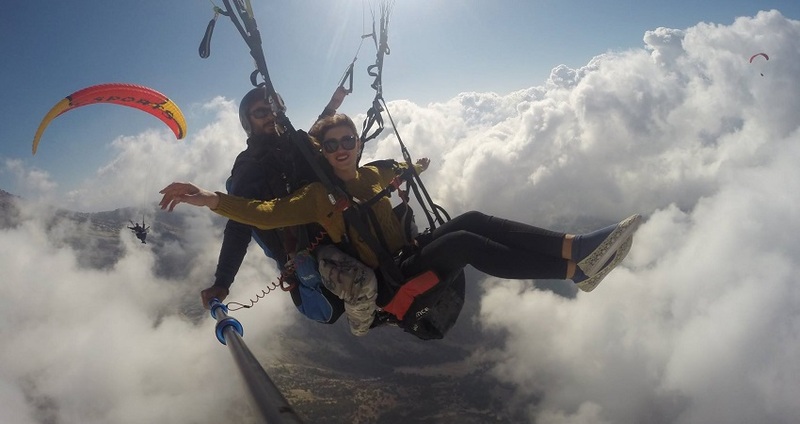 While you drift in the air as if you were in a dream, you will add a lot of spectacular moments to your unforgettable memories. 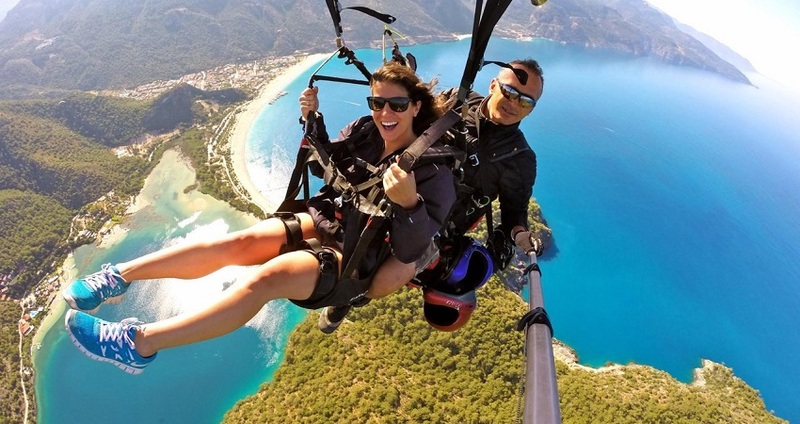 We are offering you the best paragliding tour in Fethiye with the most affordable prices. Comfortable clothing, sturdy and comfortable shoes (trainers or boots), sunglasses, bottle of water. 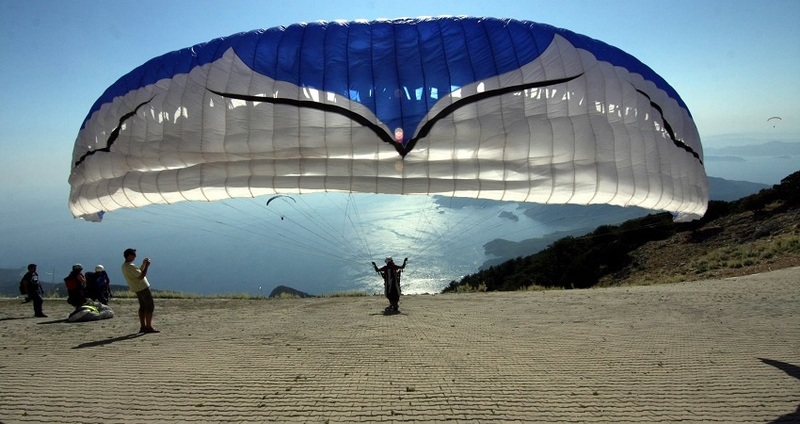 Please notice that Fethiye paragliding flight may be cancelled due to the bad weather conditions. In this case your flight is cancelled, you will get full refund or we can reschedule it for the closest possible date. If you like to visit natural beauties around Fethiye, Dalyan – Turtle Beach from Fethiye might be also interesting for you. 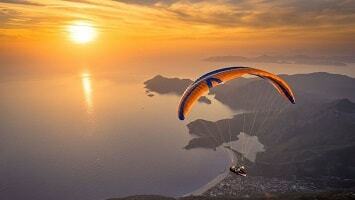 Our thrilling Fethiye Paragliding is an Any Time Tour. So you will be able to choose the time that is most convenient for you. On the tour day, our driver will be waiting for you in front of your hotels on the time that you choose. You will be at the take off location after a short drive of 45 minutes. 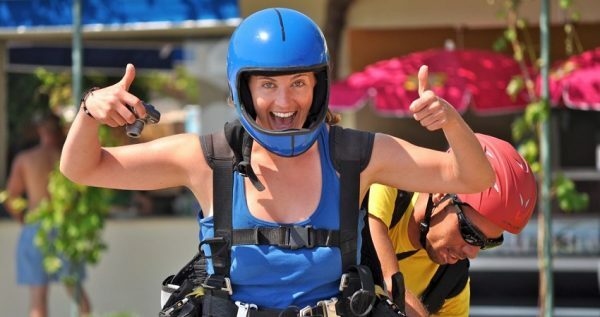 When you reach the departure runways, you will receive a training by our professional paragliding instructors. They will explain you what to do and do not before taking off. You will be carefully informed in detail by the professional trainers about taking off, the process on the air and coming back to the ground. They will be sure about everything is all right and safe for you. Babadag Mountain is an important spot for paragliding in Fethiye and in Europe. It is the only spot in Europe to paraglide from a height over 1900 meters. It is a mountain that is 1960 meters high from the sea level and with its geographical location, it offers a unique place for this amazing sport. The runways can be reached after 40-45 minutes-long driving. 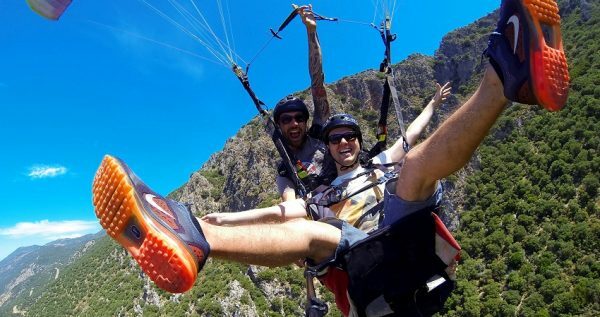 As it is an unique spot all over the Europe, it is very popular during the season for paragliding. 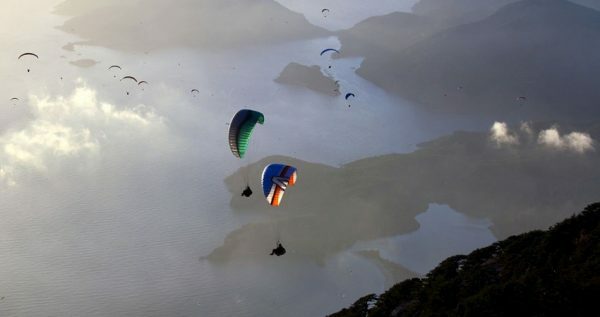 On Babadag Mountain, there are three runways used for paragliding. The first one is at 1700 meters and takes the south wind. It can be used by 20 wings at the same time. The second one is at 1800 meters and the third and favored one is at 1900 meters. Before taking off, your gears will be checked by your trainer in order to be sure about your safety. You will be explained what to do during take off, the process in the air and landing. 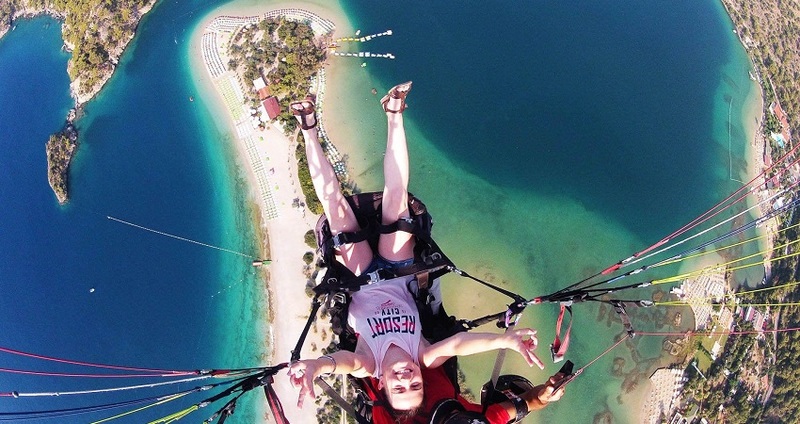 The only you should do is to enjoy the breathtaking view beneath you on the air. However, you need to be careful as your pilot may perform some drop-offs to surprise you while you are peacefully drafting on the air. After gaining experience, you will also have the chance of going solo, too. After completing our day on Babadag Mountain, we will pick you up to return you to your hotels. Our kind drivers will do everything they can do to ensure about your safety and comfort during your journey. In case you need anything, it will be enough for you to inform them about your situation.